Recipes Download recipes from your favorite websites, or add your own. 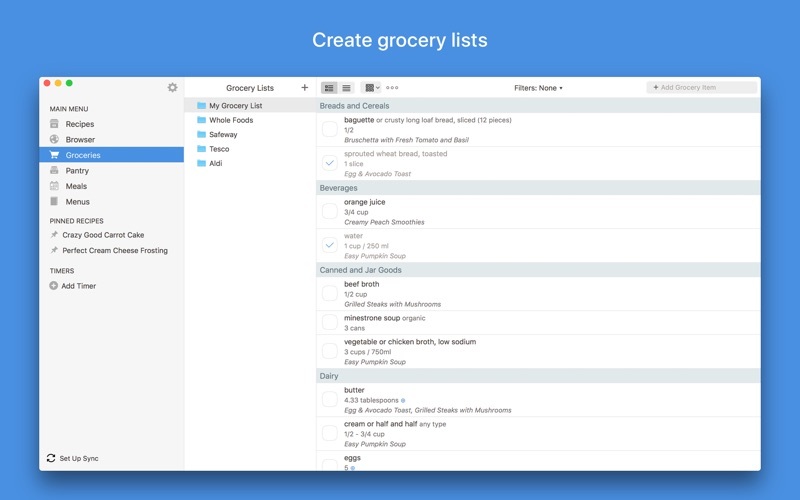 Grocery Lists Create smart grocery lists that automatically combine ingredients and sort them by aisle. Pantry Use the pantry to keep track of which ingredients you have and when they expire. Meal Planner Plan your meals using our daily, weekly, or monthly calendars. Menus Save your favorite meal plans as reusable menus. 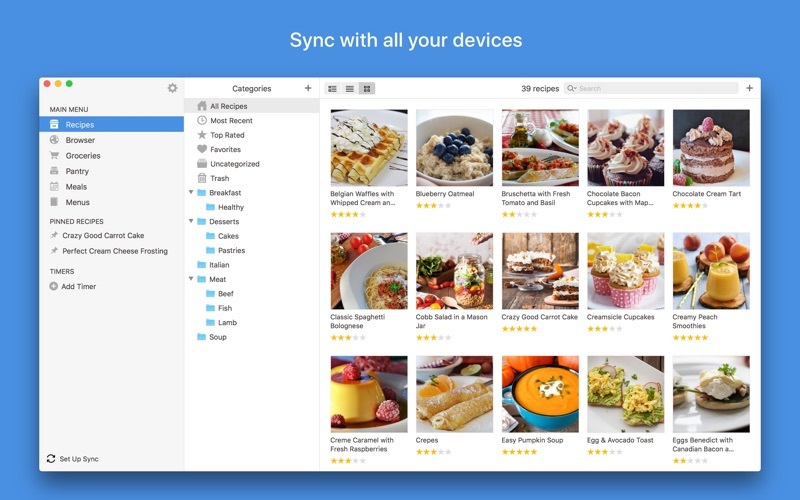 Sync Keep your recipes, grocery lists, and meal plans synced between all your devices. Adjust Scale ingredients to your desired serving size, and convert between measurements. Cook Keep the screen on while cooking, cross off ingredients, and highlight your current step. 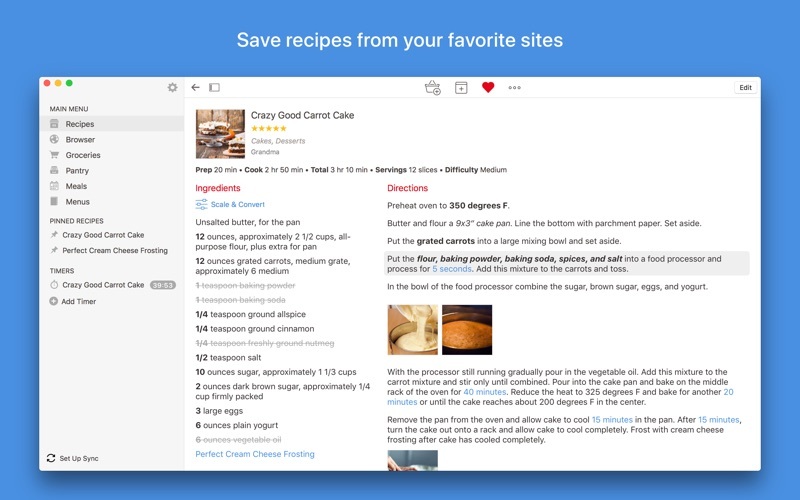 Search Organize your recipes into categories and subcategories. Search by name, ingredient, and more. Timers Cook times are automatically detected in your directions. Simply tap on one to start a timer. Import Import from existing apps such as MacGourmet, YummySoup!, MasterCook & Living Cookbook. 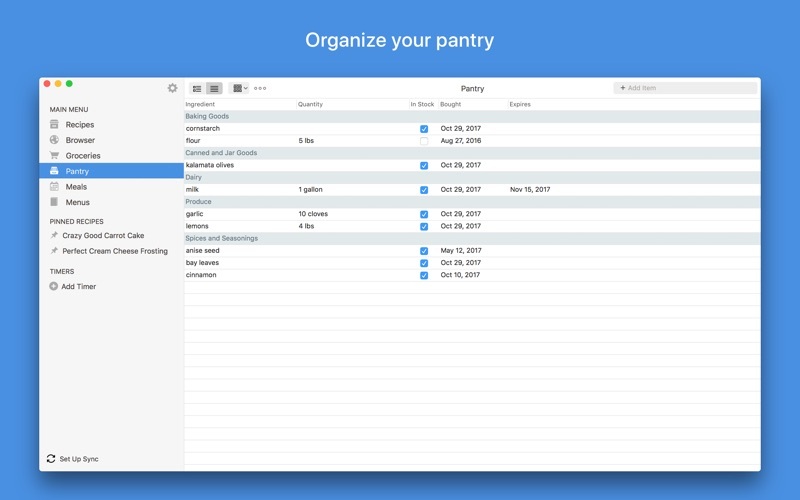 Export Export your meal plans to Calendar and your grocery lists to Reminders. Share Share recipes via AirDrop or email. Print Print recipes, grocery lists, menus, and meal plans. Recipes support multiple print formats including index cards. Extensions Save recipes directly in Safari and view today’s scheduled meals. 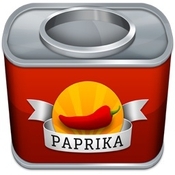 Bookmarklet Download recipes from any browser straight into your Paprika Cloud Sync account. Offline Access All of your data is stored locally. No internet connection is required to view your recipes. Add multiple, fullsized photos to each recipe. Embed photos in your directions. Insert links to other recipes or websites in your ingredients or directions. Format recipes using bold and italics. Convert ingredient measurements between standard and metric. Search for recipes across multiple categories. Add custom aisles to your grocery list and rearrange them in your preferred order. Add custom ingredients to the pantry. Track quantities, purchase dates, and expiration dates. Move items back and forth between the pantry and grocery list. 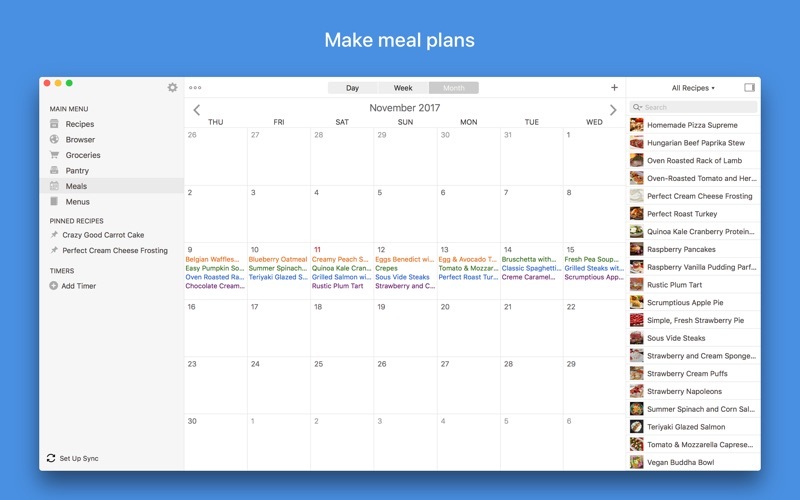 Add custom meal types to the meal planner. Create reusable menus that span multiple days. The ingredient scaler will now preserve measurement abbreviations when scaling ingredients. Fixed scaling of certain casesensitive measurements (1t vs 1T). Fixed importing of older MacGourmet files.